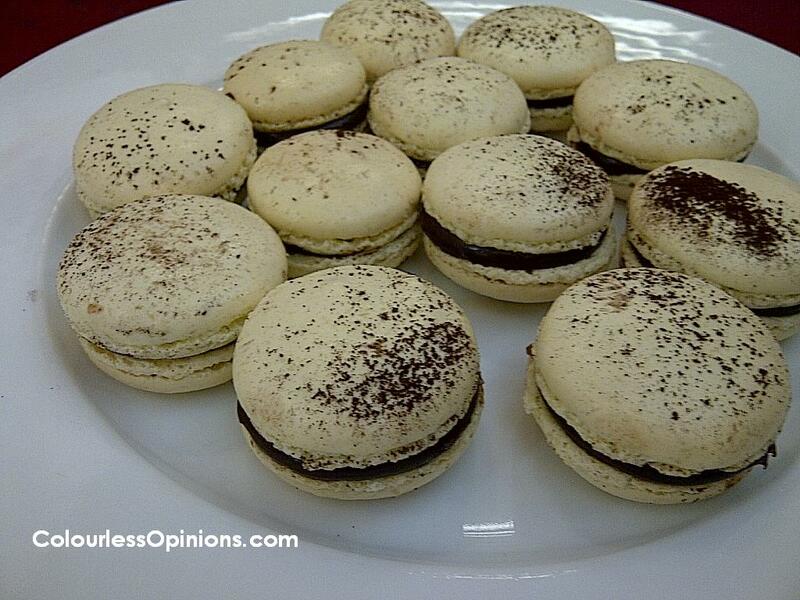 Who would’ve thought a Malaysian could win a culinary competition in France? Wait, what? You didn’t know? 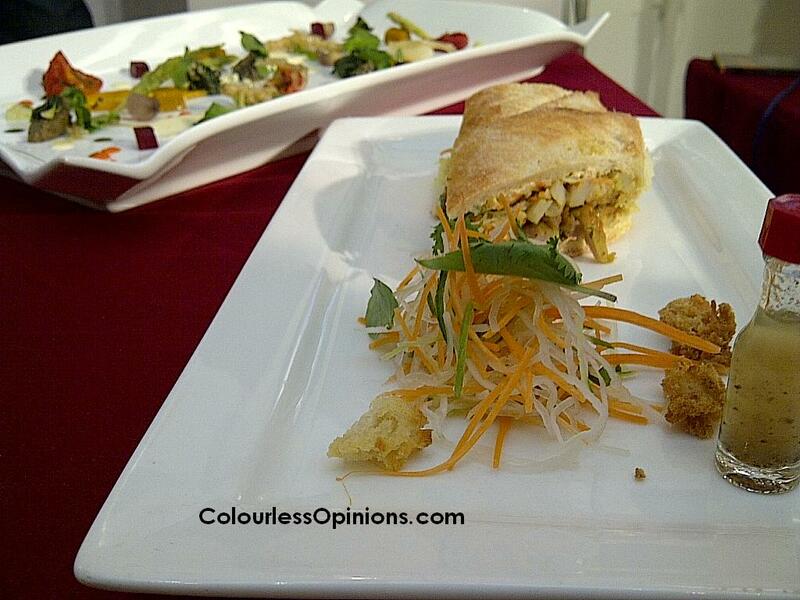 Our very own local chef, Darren Chin, was the winner of the 9th Delifrance Sandwich World Cup held in Paris earlier this year. Anyone would probably expect a French chef to win in a such a prestigious competition but not this time. The Dave’s Deli‘s founder’s son made a winning char siew (pork)-based sandwich and had one of the judges said, “It’s the best sandwich I’ve ever tasted,” naming it The World’s Best Sandwich. 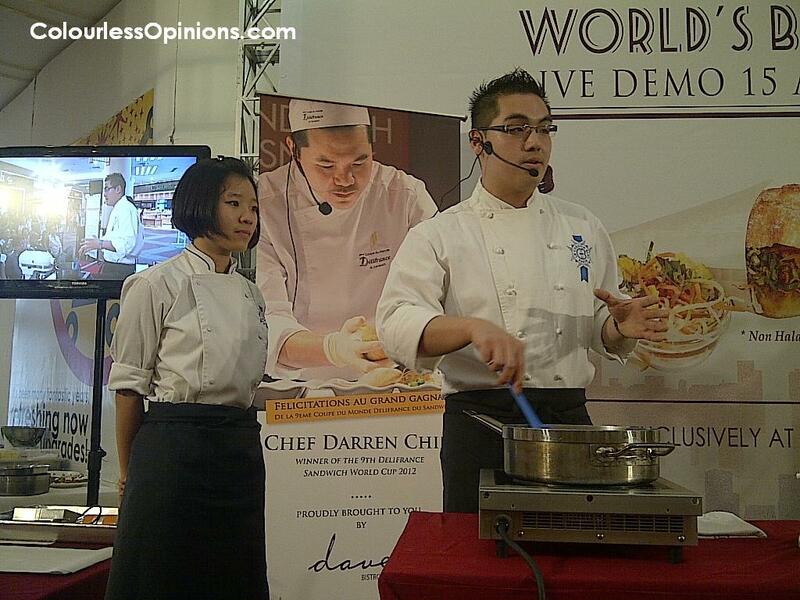 Darren has recently flew home and held a live demonstration at One Utama Shopping Mall (Bandar Utama, Petaling Jaya, Selangor) last Sunday (15 April 2012). 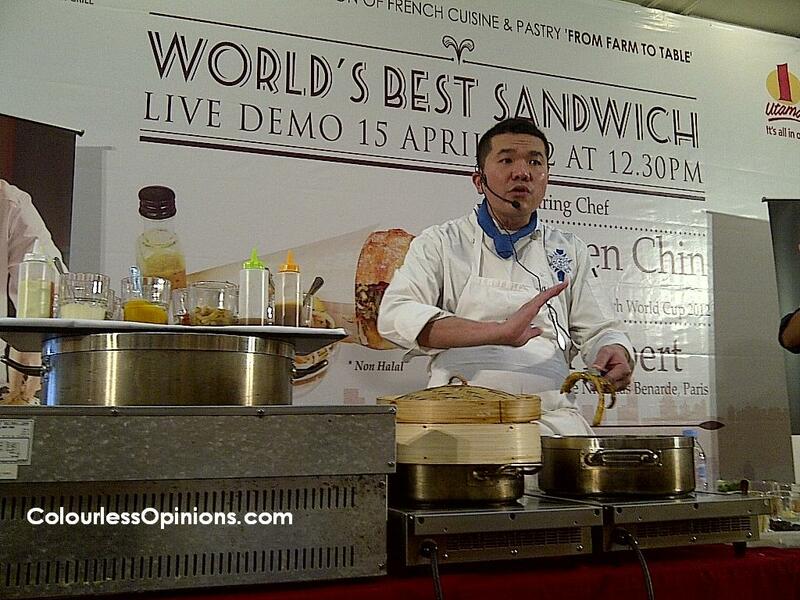 Darren Chin demonstrates how to make The World’s Best Sandwich. Darren Chin‘s World’s Best Sandwich with Gargouillou of Young Vegetables in the background. I thought I was going to taste something really special when I took a bite of the sandwich but that wasn’t the case. Although it was good, it didn’t taste like anything I’ve never tasted before. Perhaps I was expecting too much out of a sandwich. And to be fair, I ain’t no certified food-tasting expert. As part of his French cuisine cooking demo session, Darren also showed how he cooks the Lamb Loin and prepares the Gargouillou of Young Vegetables. I couldn’t get enough of the Lamb Loin that day. The first time I put it in my mouth and chewed on it, I said to myself, “It tastes so expensive!” Those who know me would know that I absolutely despise eating veges but the Gargouillou’s were just at a complete different level of quality which I wouldn’t mind munching on all day. The event also featured French chef Hubert Ly, Darren’s friend from Le Cordon Bleu Paris, who showcased how he prepares his Extremet “Agrums“, Passion Fruit Macaroon, and Financier Classic French Tea Cake during his French pastry demo session. He’s only 21 years old and has a very deep French accent. Many had difficulties understand his English, but I could understand him more clearly than when Darren was doing his demo. Probably because I’m used to listening to Arsenal Football Club’s manager (Arsene Wenger, a French) speak. Hubert Ly demonstrates how to make some French pastry. 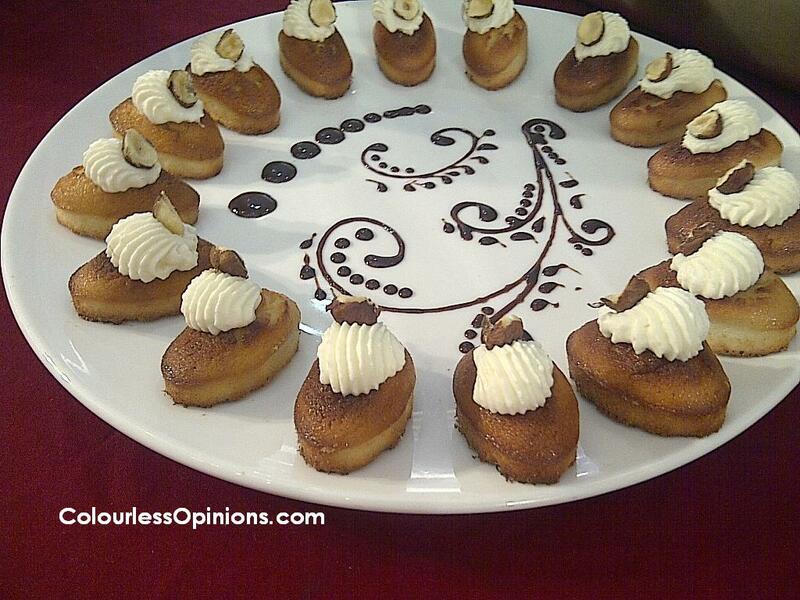 I got to taste all three of the pastries and I actually liked all of them equally. If I really have to pick a favourite, I would have to say the Tartlets of Citrus Fruit Mousse, which I didn’t manage to get a nice shot on. Actually I don’t think it was a part of his demonstration. But I absolutely loved it. Some people that tried it made displeasing faces and didn’t even wanna finish. Well of course, they only took small bite at the top and they would’ve tasted completely like lime. The trick was to put the whole thing into the mouth because it needs the soft biscuit at the bottom to create that heavenly taste. Classic French Tea Cake with Chocolate Ganache. 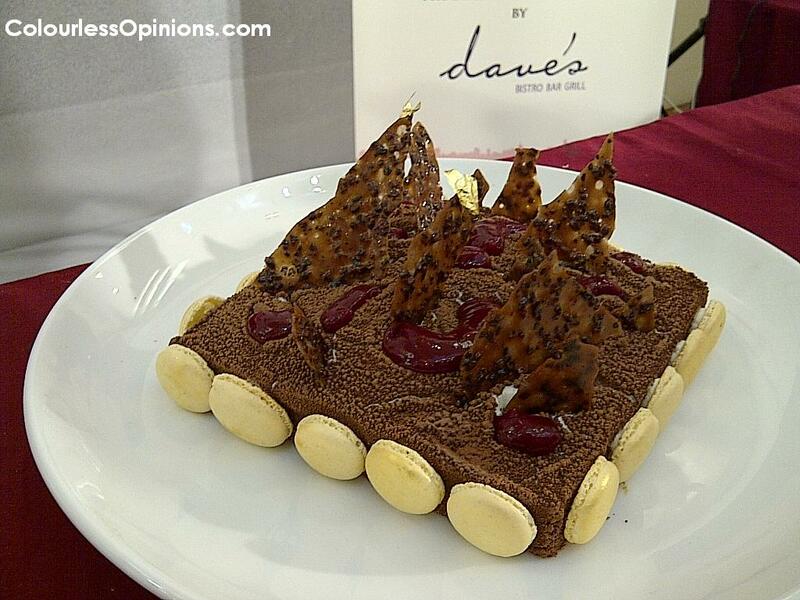 Both the chefs will also be having an exclusive one-time-only gala dinner themed “A French Affair” at Dave’s Bistro, Bar & Grill (One Utama) tomorrow (21 April 2012) for RM250 per person. You will get to enjoy Darren’s Lamb Loin, Hubert’s Passion Fruit Macaroon, and many more other sensational French dishes cooked by them. Please call 03-7725 4017 to enquire or make reservations, if it’s not already fully reserved. For those who wishes to try The World’s Best Sandwich, the Halal version of it will be made available at Dave’s Deli restaurants very soon. I’d wanna give that a shot as well. Maybe I’d like it more than the original. I’ll let y’all know what I think on my Twitter or Facebook Page. I miss that chewy sandwich d.. Sandwich with fresh vege is a must!